The complete version of this audit was awarded the Richard Taunton Southwood Prize for orthopaedic Research for best orthopaedic audit 2014. Dr. George has presented on the topic of clavicle fractures at both state and national orthopaedic conferences throughout 2014/15. Professor Jaarsma is the head of orthopaedic trauma at Flinders Medical Centre and a Professor of orthopaedics at Flinders University overseeing all student audits in the Department of Orthopaedics. Background: The clavicle is one of the most commonly fractured bones in the body. 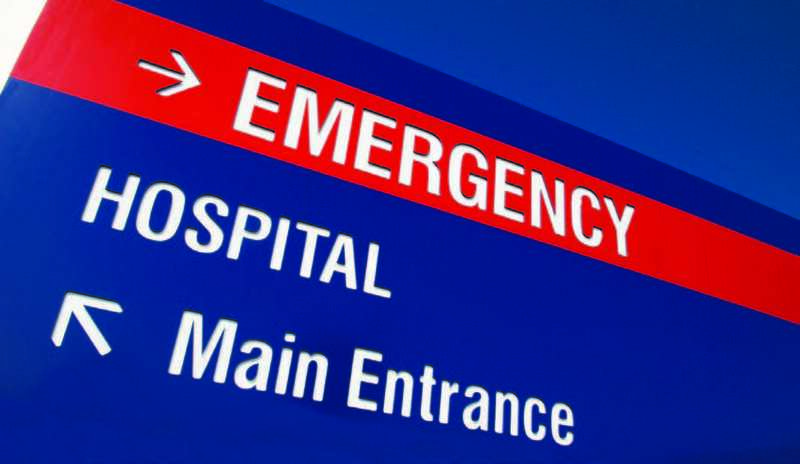 Interns are often delegated to treat these cases in an emergency department. This audit looks at the adherence to a tertiary hospital’s clavicle fracture protocol and reviews the literature to provide suggestions on updates based on current evidence. Methods: A retrospective case note and radiograph audit was undertaken to assess adherence to current protocols for the calendar years 2012 and 2013. A literature search was performed to find the most up to date evidence for future clavicle fracture management. Results: There were 131 clavicle fractures reviewed. An AP x-ray was taken in 120/122 cases (98.3%). The Orthopaedic registrar was notified for 6/7 (86%) cases with respiratory, neurovascular or skin compromise. 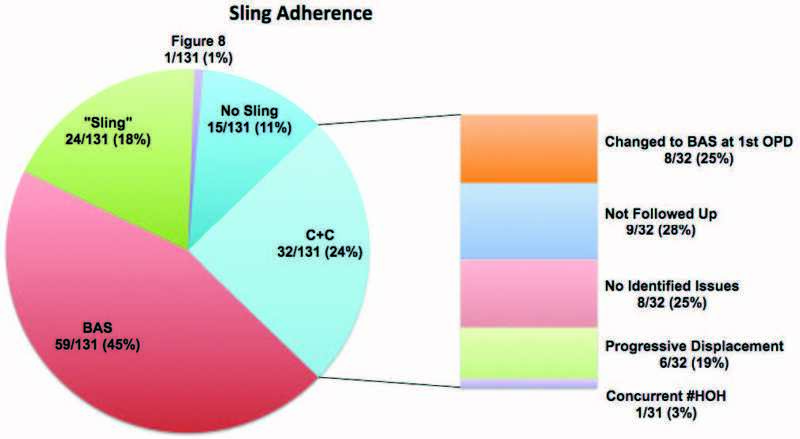 Up to 83/131 (63%) patients were provided with a broad arm sling. Mean initial follow up was at ten days (3-20 days) and 39/95 (41%) followed x-ray protocol at this review. Appropriate rehabilitation advice was documented in 12/82 (14.6%) cases and the mean duration until discharge was 52.25 days. Conclusion: Despite the high frequency of clavicle fractures there are still significant errors that can be, and are being, made in their management. It is important for all medical students and junior doctors to become familiar with this Orthopaedic condition, as it is a common presentation that is often initially managed by junior medical staff. Clavicle fractures are commonly managed by junior staff, and the current adult fracture protocol at our institution guides this management (Figure 1). The protocol was issued in July 2006 and reviewed in 2009. However, this protocol remains based on evidence the most recent of which was published in 1997. [3–8] There has been an influx of published literature on clavicle fractures over the last decade providing more recommendations for which an updated protocol can be based, including two well-designed multi-centre randomised controlled trials. [1,9,10,11,12,13] These articles demonstrate the shift from conservative management to surgical management for displaced and comminuted fractures of the adult clavicle. This retrospective case note and radiograph audit firstly assesses the adherence of management practices at a tertiary hospital to the current institutional protocol for the calendar year of 2012 and 2013. Secondly, it discusses the standards of best practice in the current literature, with the view to providing recommendations for alterations to hospital protocol and management practice. In preparing for this audit a literature review was conducted to identify the gold standard and best practice guidelines for the investigation, management, and rehabilitation of clavicle fractures. Additionally, the hospital intranet was searched for any further documents including protocols, information sheets, and patient handouts. Consultation with the physiotherapy (PT) and occupational therapy (OT) departments was undertaken to assess any current gold standards, best practice or unwritten guidelines. The case notes and radiographs of patients identified with a clavicle fracture were reviewed and adherence to the current protocol was assessed. Specifically, adherence to the following aspects of the protocol was scrutinised (Figure 1). Return to sport (RTS) should be delayed for at least 4-6 months. Figure 1. The current adult clavicle fracture protocol for which adherence was audited. This audit was reviewed and approved by the local clinical human research ethics committee. No identifiable patient data was collected and all records were viewed on site in the medical records department. A retrospective case note and electronic record audit was performed for the calendar year of 2013. As insufficient data was available to make reliable conclusions an additional calendar year, 2012, was included. With the assistance of the orthopaedic department and the support of the project manager, all patients with clavicle fractures who presented to the emergency department (ED) or who were admitted to the wards in the calendar years 2012-13 were included. The hospital coding system, Inpatient Separations Information System (ISIS), was searched using the World Health Organisation (WHO) International Classification of Diseases, version ten, (ICD10) codes for all clavicle fracture admissions, S4200-3 inclusive. In addition the ED database for the two calendar years was hand-searched for provisional diagnoses relevant to clavicle fractures. This limited selection bias caused by spelling errors if searched electronically. These searches provided a list of 141 patient unit record numbers (URN) that were provided to medical records for retrieval. All case notes were reviewed immediately once available to minimise loss to the removal of records. Missing records were re-requested and viewed on multiple occasions until all records had been accounted for. Despite multiple searches two case notes were unable to be retrieved, being listed on the system as in stock but unable to be located by staff. For these two cases the electronic records were viewed to minimise selection bias and to ensure all patients were analysed. Each patient file was meticulously studied and cross-referenced against the electronic discharge summaries and encounters, in addition to radiological analysis using a picture archiving and communication system. Data was collected and stored in a Microsoft Excel (Copyright Microsoft Corporation 2010) spread sheet. Simple descriptive statistical analysis was performed using IBM SPSS version 22 (Copyright IBM Corporation and other(s) 1989, 2013). In consultation with the orthopaedic department it was determined that 90% compliance with the current protocol would be deemed acceptable. Adherence was analysed collectively for the entire cohort but also separately for the two calendar years, surgical versus non-surgical patients, and then again against current literature recommendations. Only the collective data will be presented. At the two week review 39/95 (41%) cases followed protocol regarding XROA. The conservative group were not required to have an x-ray at two weeks with adherence in 30/85 (35.3%), however, 13 of these had x-rays at subsequent appointments. For the conservative cases that did have x-rays at their first outpatient department (OPD) appointment 3/55 (5.5%) resulted in a change of management toward surgery. Nine out of ten (90%) surgical patients had an x-ray to check the position of the metalwork at two weeks as required. Figure 2. The typical middle third clavicle fracture that presents a management dilemma. Compliance with the protocol regarding the broad arm sling application is summarised in Figure 3. Of note 6/32 (18.8%) patients who were provided with a collar and cuff for acute management showed progressive displacement and five of these required surgical fixation. If the benefit of the doubt is given and all those who were documented as given a ‘sling’ are combined with the BAS then 83/131 (63.3%) patients were correctly treated. Figure 3. Illustrating the adherence of staff to provide a broad arm sling as first line management. BAS = Broad Arm Sling, C+C = Collar and Cuff, #HOH = Fractured Head of Humerus, OPD = Outpatient Department. The orthopaedic registrar was notified 46 times for the 131 cases analysed (35%), although according to the protocol they are only required to be notified if there is respiratory, neurovascular, or skin compromise. In this case they were notified on six out of seven occasions (86%). 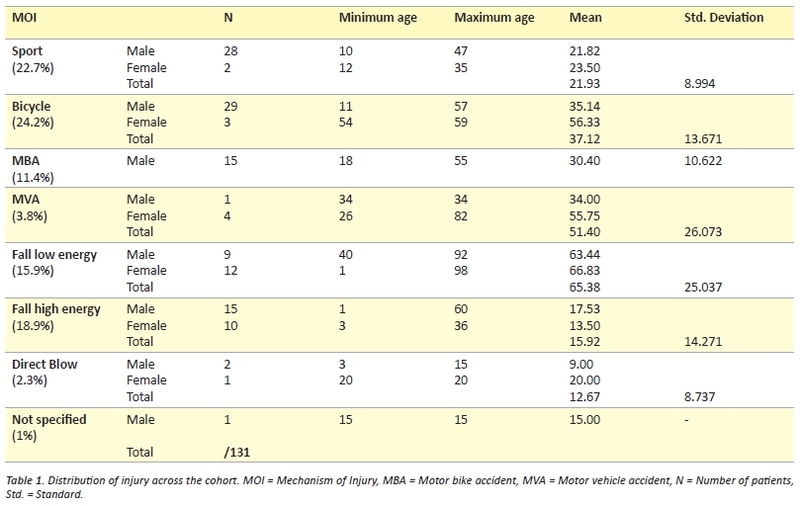 However, if they were also required to be notified for displaced fractures >20mm and shortened >15mm in addition to the associated injuries in the protocol, then they were notified in 27/51 (53%) cases. Cases of which the orthopaedic registrar was not informed of include one floating shoulder, three ACJ separations, one head of humerus (HOH) fracture, and one patient with ipsilateral rib fractures 1-5. Prior to the outpatient follow up six patients re-presented to ED, two patients on multiple occasions. Of these two were treated with a collar and cuff and one with a sling. Complications or associated injuries were present in 18/131 cases (13.7%), five with tented/compromised skin, six ACJ separations, four floating shoulders, one ipsilateral HOH fracture, one ulnar nerve paraesthesia, and one patient with multiple ipsilateral rib fractures. Of these six underwent surgical fixation. There were 14 surgeries (11 middle third, three lateral) and eleven patients received private orthopaedic management (Table 2). There were 82 patients followed up in the orthopaedic OPD clinic. Twelve of these (14.6%) had sufficient documentation to suggest the patient had been provided with appropriate rehabilitation advice. These included 4/9 (44%) surgical cases and 8/73 (11%) conservative cases. This left a large cohort of patients that had been given some or no advice on what rehabilitation they could perform. Six patients attended their six-week review having been immobilised in their sling for the entire duration leading to stiff painful shoulders. In eight case notes there is mention of seeking physiotherapy treatment of which two cases were treated by the hospitals physiotherapy department. There are no current physiotherapy handouts or protocols and the occupational therapy department has no involvement in the management or rehabilitation of clavicle fractures. Clavicle fractures are a common presentation to any emergency department, representing 5% of all fractures, and are often managed by junior staff. This audit demonstrates that there is still some mismanagement and that further education of junior staff is required. Conservative treatment remains the management of choice for isolated non-displaced clavicle fractures. [12,18] The broad arm sling is recommended for clavicle fractures,  as the collar and cuff allows traction on the arm that risks further displacement of fracture segments. [20,21] The figure-of-eight slings have not been shown to be superior to the broad arm sling and are more uncomfortable and difficult to use. Our results demonstrate that the collar and cuff is still being provided in many cases over the preferred broad arm sling. This may be due to confusion with the fractured neck of humerus that requires distracting forces for fracture alignment. One fifth of patients provided with collar and cuffs demonstrated significant progression of fracture displacement with many of these requiring surgical fixations. While most isolated non-displaced fractures of the clavicle are managed conservatively, it is important to know when to refer to the orthopaedic department for review. Clear operative indications include compromise to the skin, nerves, vasculature, and grossly displaced/comminuted fractures. Some authors also advocate for the primary fixation of clavicle fractures with multi-trauma, ipsilateral shoulder injuries, acromioclavicular joint (ACJ) involvement, high velocity mechanisms, or young active individuals. [24,25] For these patients, the surgeon’s preference continues to dictate treatment. As such it is difficult to create a protocol to mandate management and the protocol is rather a guide to prompt management considerations. In this audit, the orthopaedic registrar was notified for most cases where there was neurovascular, respiratory, or skin compromise. However, in the current protocol there is mention of displacement and shortening with a decision to be made on whether the fracture is stable or unstable and whether the patient receives surgical or conservative management. If the orthopaedic registrar was required to be notified to make this decision then they were only notified in half the cases. It may be seen as an increased demand on the ED if they had patients waiting in beds for an orthopaedic review if it was considered unnecessary. Murray and colleagues have shown that shortening and displacement are risk factors for non-union and it has been shown that delaying surgery results in worse functional outcomes. [24,32,33] Hence, it would be prudent to have an orthopaedic review in ED to make the clinical decision regarding management immediately. While this would increase the demand on orthopaedic staff to review x-rays and or patients from ED it also has the potential to decrease outpatient demand. By providing patients with the correct treatment immediately, early (< 2 weeks) outpatient follow up can be avoided and the six re-presentations to ED potentially avoided. Additionally if more accurate predictions are made for probable outcomes then work loads can be reduced by minimising the patients that are treated for extended periods or who fail conservative treatment and undergo additional surgical fixation. There was a large variation in time to outpatient follow-up after ED discharge. This potentially reflects the uncertainty of the ED staff in their management of the patient. Rather than discharging the patient with appropriate sling, pain medication, and early rehabilitation advice they are requesting very early orthopaedic outpatient follow up essentially doubling the patient’s visits. Radiological evaluation at the two-week review was over-utilised with correct use in less than half of the patients. This again could reflect uncertainty among medical staff about management. Of the 55 conservative patients undergoing multiple x-ray evaluations, a change in management was only initiated in three cases. Progressive displacement of the fracture ends has been recognised in one third of cases over a 5-year period by Plocher et al. who recommends serial x-rays for the first 3 weeks. However, repeated x-rays are not useful unless the information is going to be used to guide clinical decision-making. Again, identifying patients at risk of progressive displacement (such as high velocity injuries) or those on the cusp of surgical intervention and providing early decision-making could remove the need to wait and watch. Advice on rehabilitation was poorly documented and may reflect that it was not provided adequately in many cases. Documentation of education provided is an important part of keeping legal records and only one-fifth of patients had documented evidence that rehabilitation advice was provided. It was evident that no advice had been given for the six patients that returned to the six-week review having remained immobilised in the sling. Rehabilitation timeframes are largely based on expert opinion and are generally consistent with the current practices. 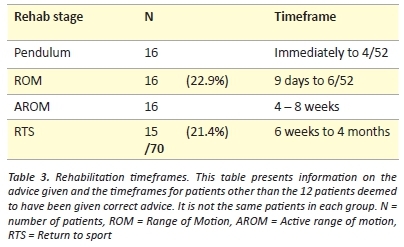 [9,20,34] There has been limited research into the optimal timeframe to return to sport, however one study followed 30 patients after plate fixation and 20 had returned to sport after twelve weeks. Three conservative patients re-fractured within 3-5 months in our audit population suggesting that returning to full contact sport should be delayed greater than six months. Especially dependent on the accuracy of the doctor’s written case notes and discharge summaries for the above steps and also audit data collection. Every effort was taken to ensure that the data collected was accurate including cross-referencing across multiple platforms. In stating this, however, the data collection for the variables dependent on documentation can only be as accurate as the written information and may not be a true representation of actual events. This would impact most significantly on the reporting of the sling provided, orthopaedic registrar notification, and rehabilitation advice given. The methods used do not capture the cases that were directly referred to the outpatient department without first presenting to ED or as an inpatient. However, the majority of this audit involved looking at the initial management, as per the protocol, and therefore these cases were not required. Clavicle fractures are a common presentation to any emergency department and are often managed by junior staff. This audit demonstrates that there is still some mismanagement, particularly in radiological assessment, sling prescription, and knowledge of protocol for registrar notification, outpatient follow-up and rehabilitation. Furthermore, new evidence indicates that the current protocol at this institution requires updating to clarify the requirements for referral and allow earlier interventions or rehabilitation. In summary, recommended radiological views are a standard AP and a second AP with 20 degrees cephalic tilt. Isolated non-displaced fractures of the clavicle are almost always managed conservatively, however, it is important to know when to refer to the orthopaedic department for review. This is always necessary if there are associated injuries or pending complications. It is also recommended that all displaced or comminuted fractures be referred for an orthopaedic opinion. The broad arm sling is the immobilisation technique of choice and not the collar and cuff for clavicle fractures because the collar and cuff allows distracting forces that risks further displacement of the fracture segments. Early rehabilitation is required to prevent painful stiff shoulders. The authors would like to thank Katharina Denk, orthopaedic research assistant for her work in identifying patients records for inclusion in this audit. Khan LA, Bradnock TJ, Scott C, Robinson CM. Fractures of the clavicle. J Bone Joint Surg Am. 2009;91(2):447–60. Postacchini F, Gumina S, De Santis P, Albo F. Epidemiology of clavicle fractures. J Shoulder Elb Surg. 2002;11(5):452–6. Andersen K, Jensen PO, Lauritzen J. Treatment of clavicular fractures. Acta Orthop Scand. 1987;58(1):71–4. Bostman O, Manninen M, Pihlajamaki H. Complications of plate fixation in fresh displaced midclavicular fractures. J Trauma Inj Infect Crit Care. 1997;43(5):778–83. Nordqvist A, Redlund-Johnell I, von Scheelel A, Petersson CJ. Shortening of clavicle after fracture: Incidence and clinical significance, a 5-year follow-up of 85 patients. Acta Orthop Scand. 1997;68(4):349–51. Hill JM, McGuire MH, Crosby LA. Closed treatment of displaced middle-third fractures of the clavicle gives poor results. J Bone Joint Surg Br. 1997;79-B(4):537–9. Davids PHP, Luitse JSK, Strating RP, van der Hart CP. Operative treatment for delayed union and nonunion of midshaft clavicular fractures: ao reconstruction plate fixation and early mobilization. J Trauma Inj Infect Crit Care. 1996;40(6):985–6. Hutchinson MR, Ahuja GS. Diagnosing and Treating Clavicle Injuries. Phys Sportsmed. 1996;24(3):26–36. Canadian Orthopaedic Trauma Society. Nonoperative treatment compared with plate fixation of displaced midshaft clavicular fractures. A multicenter, randomized clinical trial. J Bone Joint Surg Am. 2007;89(1):1–10. Robinson CM, Goudie EB, Murray IR, Jenkins PJ, Ahktar MA, Foster CJ, et al. Open reduction and plate fixation versus nonoperative treatment for displaced midshaft clavicular fractures: a multicentre, randomized, controlled trial. J Bone Joint Surg Am. 2013;95-A(17):1576–84. Robinson AM. Fractures of the clavicle in the adult epidemiology and classification. J Bone Joint Surg Br. 1998;80-B(3):476–84. Lenza M, Buchbinder R, Johnston R, Belloti J, Faloppa F. Surgical versus conservative interventions for treating fractures of the middle third of the clavicle (Review). Cochrane database Syst Rev Online. 2013;(6):CD009363. Mckee RC, Whelan DB, Schemitsch EH, Mckee MD. Operative versus nonoperative care of displaced midshaft clavicular fractures: a meta-analysis of randomized clinical trials. J Bone Joint Surg Am. 2012;94-A(8):675–84. Nowak J, Mallmin H, Larsson S. The aetiology and epidemiology of clavicular fractures. A prospective study during a two-year period in Uppsala, Sweden. Injury. 2000;31(5):353–8. Axelrod D, Safran O, Axelrod T, Whyne C, Lubovsky O. Fractures of the clavicle: which x-ray projection provides the greatest accuracy in determining displacement of the fragments? J Orthop Trauma. 2013;3(electronic):1–3. Sharr JR, Mohammed KD. Optimizing the radiographic technique in clavicular fractures. J Shoulder Elbow Surg. 2003;12(2):170–2. Smekal V, Deml C, Irenberger A, Niederwanger C, Lutz M, Blauth M, et al. Length Determination in Midshaft Clavicle Fractures: Validation of Measurement. J Orthop Trauma. 2008;22(7):458–62. Neer C. Nonunion of the clavicle. J Amercan Med Assoc. 1960;172:1006–11. Lenza M, Belloti JC, Andriolo RB, Gomes Dos Santos JB, Faloppa F. Conservative interventions for treating middle third clavicle fractures in adolescents and adults. Cochrane database Syst Rev Online. 2009;2(2):CD007121. Jeray KJ. Acute midshaft clavicular fracture. J Am Acad Orthop Surg. 2007;15(4):239–48. Mckee MD, Wild LM, Schemitsch EH. Midshaft malunions of the clavicle. J Bone Joint Surg Am. 2003;85-A(5):790–7. McKee MD. Clavicle fractures in 2010: sling/swathe or open reduction and internal fixation? Orthop Clin North Am. 2010;41(2):225–31. Lenza M, Belloti JC, Gomes Dos Santos JB, Matsumoto MH, Faloppa F. Surgical interventions for treating acute fractures or non-union of the middle third of the clavicle. Cochrane database Syst Rev Online. 2009;(4):CD007428. Murray IR, Foster CJ, Eros A, Robinson CM. Risk factors for nonunion after nonoperative treatment of displaced midshaft fractures of the clavicle. J Bone Joint Surg Am. 2013;95(13):1153–8. Plocher EK, Anavian J, Vang S, Cole PA. Progressive displacement of clavicular fractures in the early postinjury period. J Trauma. 2011;70(5):1263–7. Heuer HJ, Boykin RE, Petit CJ, Hardt J, Millett PJ. Decision-making in the treatment of diaphyseal clavicle fractures : is there agreement among surgeons ? Results of a survey on surgeons ’ treatment preferences. J Shoulder Elb Surg. 2014;23(2):e23–e33. Zlowodzki M, Zelle BA, Cole PA, Jeray K, McKee MD. Treatment of acute midshaft clavicle fractures: systematic review of 2144 fractures. J Orthop Trauma. 2005;19(7):504–7. Rowe CR. An atlas of anatomy and treatment of midclavicular fractures. Clin. Orthop. Relat. Res. 1968;58:29–42. Nowak J, Holgersson M, Larsson S. Can we predict long-term sequelae after fractures of the clavicle based on initial findings? A prospective study with nine to ten years of follow-up. J Shoulder Elb Surg. 2004;13(5):479–86. Robinson CM, Court-Brown CM, McQueen MM, Wakefield AE. Estimating the risk of nonunion following nonoperative treatment of a clavicular fracture. J Bone Joint Surg Am. 2004;86-A(7):1359–65. Wijdicks FJ, Van der Meijden OA, Millett PJ, Verleisdonk EJ, Houwert RM. Systematic review of the complications of plate fixation of clavicle fractures. Arch Orthop Trauma Surg. 2012;132(5):617–25. Potter JM, Jones C, Wild LM, Schemitsch EH, McKee MD. Does delay matter? The restoration of objectively measured shoulder strength and patient-oriented outcome after immediate fixation versus delayed reconstruction of displaced midshaft fractures of the clavicle. J Shoulder Elb Surg. 2007;16(5):514–8. George DM, McKay BP, Jaarsma RL. The long-term outcome of displaced mid-third clavicle fractures on scapular and shoulder function: variations between immediate surgery, delayed surgery, and nonsurgical management. J Shoulder Elb Surg. 2015; 24(5):669-76. Kim W, McKee MD. 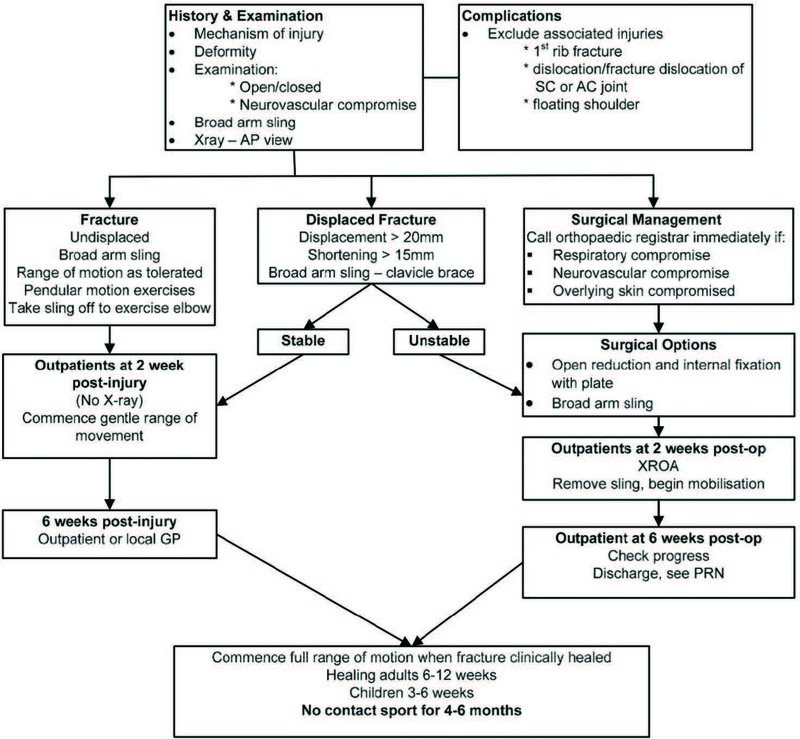 Management of acute clavicle fractures. Orthop Clin North Am. 2008;39(4):491–505. Meisterling SW, Cain EL, Fleisig GS, Hartzell JL, Dugas JR. Return to athletic activity after plate fixation of displaced midshaft clavicle fractures. Am J Sports Med. 2013;41(11):2632–6. Perioperative pain management – should we pre-empt or prevent pain? Is cellular senescence a viable strategy and endpoint for oncological control? 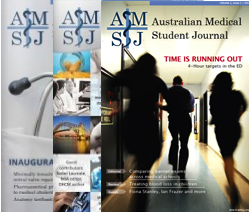 So you want to be a haematologist? Vocal cord dysfunction: A co-existent or alternative diagnosis in refractory asthma?